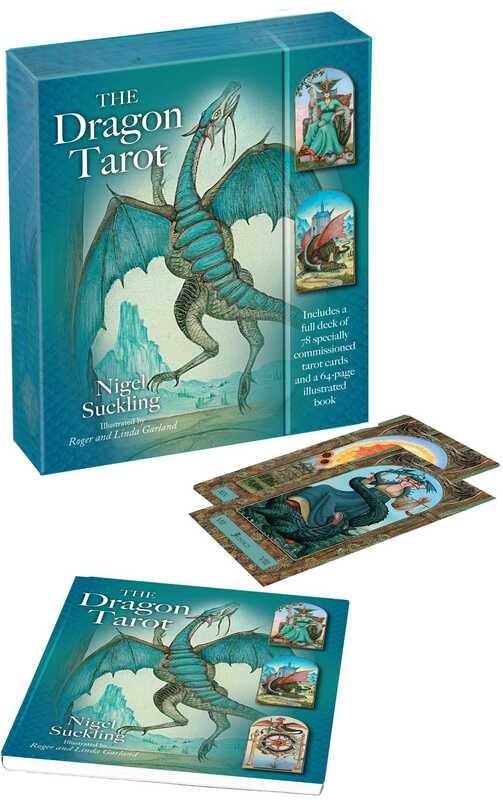 The mysteries of the tarot and the legend of dragons come together in this stunning box set, including a full tarot deck and 64-page guidebook. Majestic in its power, the dragon in Western culture appears in myth and legend as the jealous guardian of a treasure hoard—epitomized by J.R.R. Tolkien’s Smaug, and seen more recently in J.K. Rowling’s Harry Potter series and George R.R. Martin’s Game of Thrones series. But that is not the whole story—dragons are complex creatures, and the beast is usually credited with cunning and often the power of speech—it is not just a brutal, terrifying monster. Although occasionally hostile, as when an earth dragon stirs and human cities crumble, there is no personal malice. Dragons simply operate by different laws that do not always place our interest at their center. Understanding those laws and adapting to accommodate them is one path to wisdom. This is the spirit in which dragons inspire this tarot—tarot also operates by laws that are slightly beyond our conscious grasp, lifting the veil on the spiritual undercurrent of the worlds we inhabit. This traditional 78-card deck contains fire-breathing dragons, winged dragons of the air, sea serpents, and earth dwellers who will reveal to you the secrets of the past, the possibilities of the present, and all the potential of the future. Nigel Suckling is a respected author writing in the mind, body and spirit and fantasy art fields. His books include those on angels, werewolves, fairies, vampires, witches and unicorns, and he has published a bestselling deck of tarot cards, The Dragon Tarot (CICO, 2005; reissued 2008). The author is based in Tunbridge Wells, Kent.